ExcelCare HC-7152 is a seat for the bath. This convenience gives you safety seat by the anti-skid portion and the handle which can optionally be placed on both sides. ExcelCare HC-7152 provides maximum safety while bathing. The comfortable non-slip seat is made entirely of plastic. 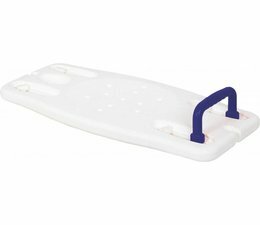 In addition, the ExcelCare HC-7152 features adjustable non-slip brackets for the most common bath widths. The seat is extra wide with excellent drainage by perforation of the seat. By default, the seat is equipped with a safety handle. To be placed on both sides.